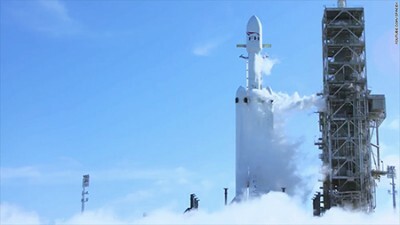 On Tuesday, Feb. 6, SpaceX launched the Falcon Heavy rocket, sending one of Elon Musk’s Teslas into space. The rocket has an awesome amount of power, with nine main rocket engines and 27 total engines used to send the vehicle into space. This is the most engines a rocket has ever used! In fact, Musk claimed you could send a 747 with all engines blazing, maximum fuel, maximum cargo and maximum passengers as cargo itself into space with this rocket, which is to say it is extremely powerful. This is a mission Musk and colleagues have been planning and pursuing since 2011. In seven years, SpaceX developed this successful technology, which has given us access to brilliant images of the earth and inspiration for future scientific endeavors involving space travel. This success is revolutionary. It opens up endless possibilities for space travel, transfer of materials and research. Nine months prior to the launch, Musk participated in a TED talk where he discussed his visions and ongoing projects. One of his goals is to populate Mars with at least one million people using this rocket technology. Musk elaborated, “There have to be reasons you get up in the morning and want to live. What inspires you? What do you love about the future? If the future does not include being out there amongst the stars and being a multiplanet species, I find that incredibly depressing.” He also stressed that, “Technology does not automatically improve. It only improves if a lot of people work hard to make it improve.” As a researcher, I find it incredibly inspiring and powerful that individuals are the force moving technology forward and Musk’s technologies and accomplishments all stem from his hopes and dreams about the future. There are many parallels between Musk’s work and our work as basic science researchers. It took seven years from the announcement of SpaceX’s mission to launch this rocket until the actual launch. Is that a long time? When we put it into the perspective of a basic science Ph.D., it seems to align with the reported time it takes to graduate (between 5 and 7 years). In theory, with our prior knowledge and training, we could propose an idea as visionary as sending an electric car into space, and complete it before graduation. To me, that seems inspiring, achievable and quick! Each day, as scientists and scientists in training, we wake up excited by the possibilities of our research. People often ask researchers about the point of doing these seemingly mundane experiments. They sometimes even question the point of our research. It’s the excitement of new possibilities, of using our hands and minds to solve what was once thought impossible, such as elucidating a biological mechanism to help cure a disease. Elon Musk sent a Tesla into Earth’s orbit; who knows what possibilities are left for us to discover and achieve?